Russian military naval radarsat. The US-P (later known as RTR) was a solar powered EORSAT (Electronic Ocean Reconnaissance Satellite). Ocean surveillance, passive satellite, Russia. Launched 1974 - 1991. Used US-Bus. AKA: 17F17;US-PM. Status: Operational 1974. First Launch: 1974-12-24. Last Launch: 1991-01-18. Number: 37 . Gross mass: 3,300 kg (7,200 lb). It used an active radar to track naval vessels from space in darkness and all weather. The RTR was an element in the integrated Soviet weapons system devoted to destruction of the US Navy's surface and submarine forces. The system used space-based platforms to obtain the location of enemy forces at sea. This targeting information was provided to aircraft, surface vessels, and submarines and fed into anti-ship missiles that would attack the US forces from over the horizon. The RLS had a complex development history, with three chief designers overseeing its development. It was conceived and designed by Chelomei in 1959-1964; redesigned and flight tested by Savin in 1965-1969; and finally completed and put into service by KB Arsenal from 1969 on. The nuclear reactor aboard the US-A crashed to earth several times, causing international incidents. Furthermore the RLS had the lowest reliability and most quality problems of any Soviet space system. Nevertheless the system eventually allowed the Soviet Union to continuously monitor naval traffic throughout the oceans of the world. The RTR (Space Complex of Radio-Technical Reconnaissance) was placed into a 420 km orbit inclined 65 degrees by the Tsyklon 2 booster. Systems aboard the 3300 kg satellite included the Radio-Technical Reconnaissance system and systems for electronic camouflage and self-protection. An engine unit maintained the orbital altitude and made a final deorbit of the satellite at the end of the mission. Beginning in the late 1950's, Chelomei began studying use of his encapsulated cruise missile technology for spacecraft. 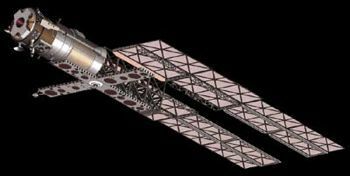 A whole family of unmanned spacecraft, dubbed Kosmoplans, would be built using modular elements. One variant of the Kosmoplan would conduct naval radar and signals reconnaissance, launched by the UR-200 rocket. In 1959, as Chelomei laid out these plans, he knew a tremendous struggle would be required to wrest a piece of the space program from Chief Designer Korolev. But Chelomei had stacked the deck against Korolev by hiring Khrushchev's son as a lead engineer at his OKB. By 30 May 1960 Korolev presented to the Soviet leadership a plan that now included participation of Chelomei. One project allocated to Chelomei was theme US - Upravlenniye Sputnik - a naval reconnaissance satellite using a P6 nuclear reactor for active tracking and targeting American warships. This was to be developed in 1962 to 1964. Chelomei was authorized by Decree 715-296 of 23 June 1960 'On the Production of Various Launch Vehicles, Satellites, Spacecraft for the Military Space Forces in 1960-1967' to complete a draft project on unpiloted Kosmoplans. At the beginning of the 1960's the Soviet Union had developed anti-ship missiles of very long range but the problem of locating the missile's targets had not been solved. 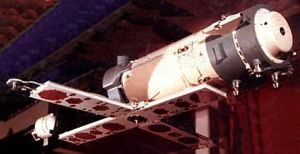 The first resolution for development of a Kosmoplan-derived Naval Space Reconnaissance and Targeting System (MKRTs) was issued in March 1961. The Kosmoplan's UR-200 (8K81) launch vehicle was approved for production on 16 March and 1 August 1961 by the Central Committee and Politburo. The Kosmoplan and UR-200 draft projects were completed in July 1962. Trial flights of the ICBM version of the UR-200 ran from 4 November 1963 to 20 October 1964. Basic research on the concept was conducted by several rocket, radio-technical, and electro-technical design bureaus and research institutes. Theoretical research in the optimum orbit for the system was undertaken at the Academy of Sciences under Keldysh. 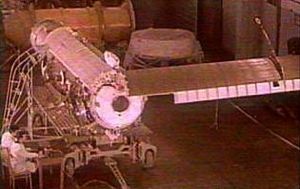 The spacecraft was developed by Chelomei at OKB-52 and A A Raspletin at KB-1 MRP. On October 13, 1964, Khrushchev was ousted from power. The new leadership, under Brezhnev, was adverse to all projects Khrushchev had supported, particularly those of Chelomei. An expert commission under M V Keldysh decided to cancel the UR-200, while the US was assigned to KB-1. Manager for the system at KB-1 was A I Savin, who was head of the renamed TsNII Kometa after 1973. The spacecraft was to be redesigned for launch by the Tsyklon 2 version of Yangel's R-36 rocket. Two separate versions of the spacecraft were to be developed. The solar-powered US-P would provide SIGINT services for the Soviet Navy and track naval ships passively. The spacecraft was still by TsKBM MOM (Chelomei) with the US-P's radio intercept system by TsNII-108. The project was jointly managed by the VMF Soviet Navy's Directorate for Rocket-Artillery Forces (URAV) and the GUKOS Military Space Force. By the end of the 1960's development was largely complete, including flight tests from 1965 of mass models and experimental prototypes equipped with orientation, stabilization, and radio-control systems. But the principal radar system had not completed development and was not available for flight test. Finally it was decided that Chelomei's NPO Mash just didn't have the resources to bring the project to completion. Furthermore the design bureau had additional tasks with development of the Almaz and DOS space stations. Therefore Afanasyev decided to transfer the entire project to NPO Arsenal in May 1969. Arsenal had proven itself in development of the RT-2, RT-15, and D-II solid propellant ballistic missiles and had extensive test stands available that could be used for spacecraft development. Work on spacecraft at KB Arsenal began in 1969 with the turnover to Arsenal of the documentation on these Chelomei-designed unmanned spacecraft. Arsenal was made responsible for series production and development of new variants. V F Kalabin was named head of the new space section. MKRTs still consisted of two satellites. The RTR (ex-US-P) electronic intelligence system was powered by a solar electric unit (SEU). The technical documentation of the RTR was virtually non-existent. A special design collective was formed under V F Kalabin to get the RTR drawings released by the first quarter of 1970. This was a new area for Arsenal and required the staff to master new electronic technology. Nevertheless by the end of 1970 the first research and development spacecraft was ready for launch and the RLS system was undergoing static trials. During the course of 1971-1972 all ground research and qualification tests were completed. Flight trials of the RTR began in 1974. These were successful and even test operations of the system marked a major new military capability for the VMF. The RTR was accepted for military service in 1978. Between 1979 and 1989 a phased modernization of the MKRTs was undertaken, providing better accuracy, localization of targets, and one-time observation capability. The entire surface of the world's ocean was continuously monitored, a feat not achieved by any other system. The system's effectiveness was proven in the 1982 Falklands War, when MKRTs monitored the British forces and was able to advise the General Staff of the Soviet Navy of the exact moment of the British landing. Family: Naval SIGINT. Country: Russia. Engines: Stepanov IS/US 16 kgf. 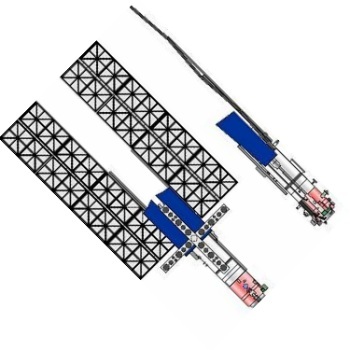 Launch Vehicles: Tsiklon, Tsiklon-2. Projects: EORSAT, RORSAT. Launch Sites: Baikonur, Baikonur LC90/19. Agency: MO, Arsenal. Bibliography: 102, 2, 376, 445, 474, 6, 13321.